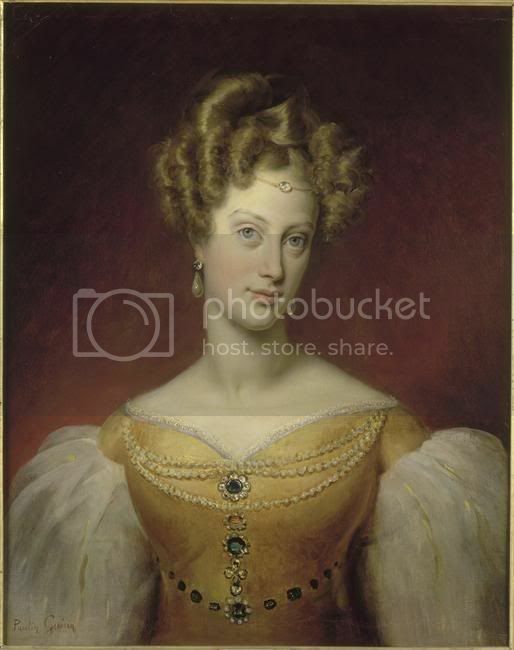 I would like to open a thread dedicated to Archduchess Maria Clementine (1777-1801), daughter of Emperor Leopold II., wife of Franz I. of Naples-Sicily. Informations and portraits are welcome! I know only one portrait of her, the one who is in your profile, has anybody others? Would be interesting. She was the mother of Maria Carolina, who married Charles de Berry, and became mother of Louise of Parma, the mother of Robert I of Parma, father of empress Zita. Has anybody infos in the life of Clementine? She died very early because of an illness I have read. Does anybody have more? Marie Clémentine Josepha Johanna Fidela, Archduchess of Austria was born on April 24th 1777 in the Castle of Poggio Imperiale near Florence. On September 19th 1790 - Clémentine was only 13 years old ! - she had to marry her first cousin Crownprince Francesco of Naples - Two Siciliesper procuram in Vienna. On the same day, Emperor Leopold's sons Franz and Ferdinand married Maria Carolina's daughters Maria Teresa and Maria Luisa. Maria Carolina is said to have been Leopold's favourite sister. But back to Clémentine ... because of her young age, she married Francesco in persona in Foggia on June 25th 1797. Clémentine and Francesco were a happy couple, but the young Crownprincess wasn't in good health. She suffered from some lung disease, maybe tuberculosis. She gave birth to two children: Maria Carolina Ferdinanda Luisa (1798-1870) and Ferdinando Francesco (1800-1801). Clémentine died on November 15th 1801 in Naples - four months after she had lost her only son Ferdinando. She was laid to rest in the church iof Sata Chiara in Naples. Because the church was destroyed during WW II, the tombs of Clémentine and her family were brought to the church of San Francesco de Paola in June 1944. On March 29th 1958 the tombs could be brought back to Santa Chiara. Nichts soll mich wieder bringen. That´s her daughter...my favourite picture, I don´t hope that it was already here, because I can´t remember the sourse. As you all know, Leopold II. hat only four daughters: Maria Theresia (1767-1827), Maria Anna (1770-1809), Marie Clémentine (1777-1801) and Maria Amalia (1780-1798). 1.) It seems to me, that all these Archduchesses didn't have a good health ... Maria Theresia gave birth to 4 children, but all of them died in infancy. Anna, Clémentine and Amalia died when they were still very young. Did all of them suffer from the same disease? 2.) Does anybody have a portrait of Maria Anna? 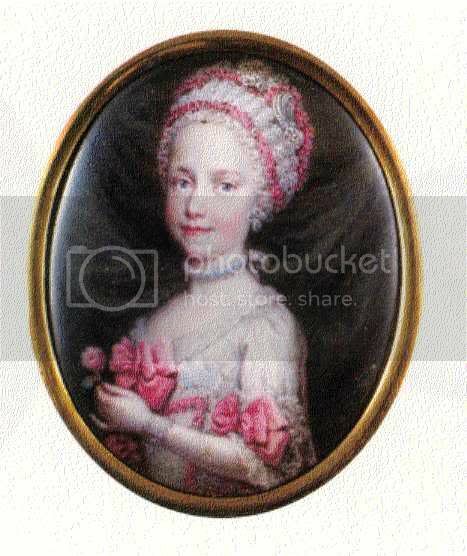 As I said on the thread with the portrait miniatures, I like this picture a lot and I think, she has much resemblence with the brothers of her mother Ludovika of Spain. As far as I know, Archduchess Maria Anna was very weak and deformed from birth. And also, although here I can be confusing her with her niece, the other Maria Anna (/1804-1858), she was a bit mentally retarded, like her maternal uncle, Philip of Naples, had been. On the picture, I had send (I hope it´s correct) Maria Anna does not look deformed anywhere, but I don´t know about her character. 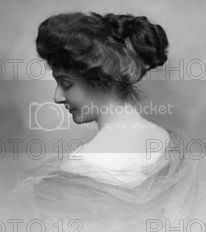 I think, these things were rather said about the other Maria Anna, daughter of Kaiser Fanz II./I. The reason must be the marriages of relatives. Maria Anna looks much like her father with the longish face, more than for ex. Marie Louise, wife of Napoleon., who was her sister. Does anybody have any more pics of our Maria Anna, the daughter of Leopold II and Maria Ludovika of Spain? The picture of the young woman you have posted, Britt, shows Maria Anna (1770-1809), daughter of Leopold II. Archduchess Maria Anna (1804-1858), "Marianna", daughter of Franz II./I. and his second wife Marie Therese of Naples, had a fragile health. Like her brother Ferdinand I. Maria Anna was an epileptic. Maybe she was also mentally retarded. There is strange story that Empress Marie Therese met a money at the zoo of Schönbrunn while she was pregnant. People thought that this must have been the reason for Maria Anna's illness. Although Ferdinand was very devoted to his sister, the other members of the family didn't like her. In my point of view they were really mean to her. They called her "Johanna the mad" and "the ill one". Archduchess Sophie called her "unlucky creature" when she wrote about her sister-in-law. In the early 1830s Maria Anna went to church when she suddenly fainted. Just like the court felt ashamed for her, all candles were extinguished and she was brought home. Yes, I know, maybe I did not expess myself correctly I wanted to know, if anybody has another picture of Maria Anna, daughter of Leopold II apart from the one, I sent. But maybe it´s too much off topic. Here is a wellknown (?) portrait of Clementine in a bigger version. If only somebody has it without watermark!